Due to high crude oil price, Indian rupee is sharply going down. During the first three years of the Modi administration, the rupee was stable as it went down from 1:62 (USD:Rupee) to 1:64 only, but in last several months of this year, India is facing full-blown currency crisis as rupee to USD is now 72 and it is the worst performing currency among all the Asian currencies. As we have seen in two previous rupee crises – 1991 (resulting in IMF bailout) and again during 2011-13 – both our rupee and our economy are vulnerable to the crude oil price. On the other hand, increase in crude oil price does not have such detrimental effect on economies of China, Japan and Germany, the economic superpowers apart from the US which solves any economic crisis by just printing its currency, taking advantage of the fact that its currency is the global currency. One point worth noting is that all three economic superpowers, namely China, Japan and Germany have had trade surpluses in the last several decades. Without having a trade surplus for a couple of decades, India cannot even dream of becoming a superpower. Suppose the crude oil price increases by 40% (say from $50 a barrel to $70 a barrel) and due to resulting Current Account Deficit (CAD) problem, rupee to USD increases by 25% (say from 1:64 to 1:80), crude oil price in terms of rupee increases from Rs 3,200 (=50 x 64) a barrel to Rs 5,600 (=70 x 80) a barrel, an increase of 75% whereas if rupee remains stable vis-à-vis to USD, the crude oil price in terms of rupee would be only Rs 4,480 a barrel, an increase of 40% only. Therefore a significant rise in crude oil price has a detrimental effect on Indian economy. In order to mitigate the detrimental effect of crude oil price rise on the Indian economy, India has to have trade surplus by either drastically reducing the crude oil import or substantially increasing the exports and both of them requires long-term planning. In the present global consumer export business, India cannot undersell China because China has already become the global manufacturing centre by importing minerals globally, converting them to consumer items and then selling them worldwide below manufacturing price. As explained in my article The Hidden Cost of Imported Items and The Need to Redefine Modi Administration’s “Make in India” Policy, if China sells an item for $100 to another country, it is actually costing China much less, say less than $30, because of the creation of associated jobs inside China. Hence India urgently needs to use its scientific and technical resources, which is in the top five in the world, to drastically reduce the crude oil import by replacing it with renewable energy resources. During both the crude oil related previous CAD crises, Dr Manmohan Singh, an economist, was at the helms of affairs (1991-96 as Finance Minister and 2004-14 as the Prime Minister). Hence he should be blamed for not coming up with a long-term strategy to defend the economy from the devastating effect of an increase in the crude oil price. We have to also blame the economists, especially US-based “imported” economists and the political leaders who depended on the former, for the letdown. “Prime Minister Modi is fortunate that he took over the reins in 2014 when the crude oil price went down and not earlier. Due to the drastic reduction in crude oil price in the last couple of years, the trade deficit has gone down somewhat.” (pp. 137-8). China is anyway in a better position to withstand the storm than Trump should a full-blown trade war unfold. That’s because it has the tools and resources to help those adversely affected by the fallout from a trade war while the U.S. does not, he said. In Mr Stiglitz’s comment, the keyword is China’s $3 trillion FOREX which was actually $4 trillion in 2014 and China has spent $1 trillion on its OBOR (One Belt One Road) project in last four year for the economic colonialism of several Third World Countries by trapping them in debt. Due to too much influence of the US-based “imported” economists on economic policies, India never gave the trade surplus a priority. The US-based economists are agents of the American economic colonialism. They would never teach India something which would negatively affect the US dollar and US economy because these economists are in India for just 3 or 5 years tenure and thereafter, they go back to the US and hence their ultimate allegiance is to the US and not to India. Under the 1944 Bretton Woods Agreement, signed by 44 countries, the US enticed all other countries by claiming that it would keep its dollar pegged to gold at the rate of $35 for one ounce of gold. The US asked other countries to use the US dollar as reserve currency and also for conducting transactions between countries. As per the agreement, you could have asked the US govt to give you one ounce of gold for $35. The US had a trade surplus from the end of World War II till 1971, but since it has had trade deficit year after year. The reason for it is that Nixon de-linked the dollar from gold in 1971, after which the US has just continued to print dollars to fund its trade and budget deficits. This has been going on since the Reagan administration. Therefore the US-based economists would never give importance to trade surplus. They will never teach you or show you the path to get out of US dollar “maya” (“US dollar illusion”, i.e. US dollar Ponzi scheme – read my article The US Dollar – A Ponzi Scheme) because if they would, their career in US is finished. They will only teach you how you can work hard, competing with other exporting countries, to get a pie of the US consumer market. China recognized the US dollar maya and hence since the very beginning, they started to accumulate dollars, by having trade surplus year after year, to create a war chest of $4 trillion FOREX. China is now in a position to replace the US dollar maya with its own yuan maya, i.e. to make yuan a Ponzi scheme. These economists are the Bhisma Pitamah of Mahabharat. Bhisma Pitamah was a very honest person but had allegiance to the throne of Hastinapura. Hence in the Mahabharat war, he fought on behalf of Kauravas, who were ruling Hastinapura, against the righteous Pandavas despite knowing that the Kauravas were evil and doing injustice to Pandavas. In 2016, India ranked third in oil consumption with 212.7 million tons after USA and China. India’s self-sufficiency in petroleum products declined from 22 per cent in 2013-2014 to 18 per cent in 2016-17 due to strong consumption growth and declining domestic production. Although the Modi administration’s directive was to cut oil import dependence by 10 per cent by 2022 over 77 per cent dependence in 2014-15, the dependence has only increased as now in 2017 it was over 80 per cent. This per cent is going to increase further with an increase in middle-class population. Crude oil is the most costly item in India’s import bill. Hence any rise in its price plays havoc with the Indian economy. 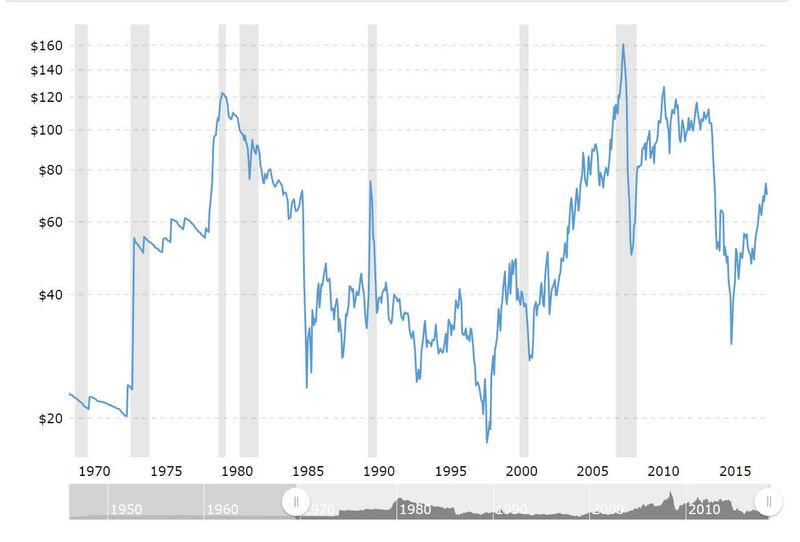 As shown in Chart 1 below, there was a sudden spike in crude oil price in 1979 which was mainly due to the overthrow of the Shah regime by the Iranian Revolution in the same year. The India’s import bill also drastically increased as shown in Chart 2. 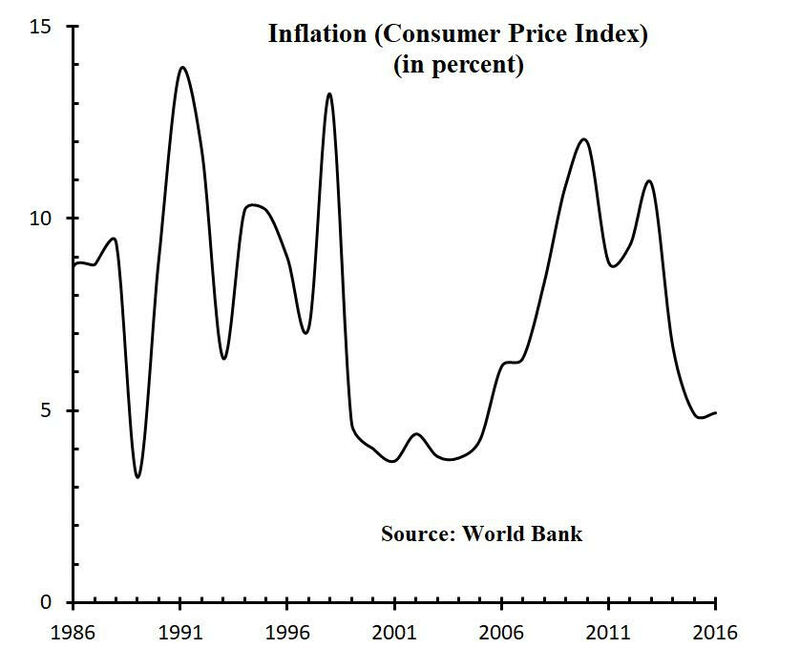 Apart from this, the Iraq-Iran War (1980-88) also became a factor in crude oil price increase. 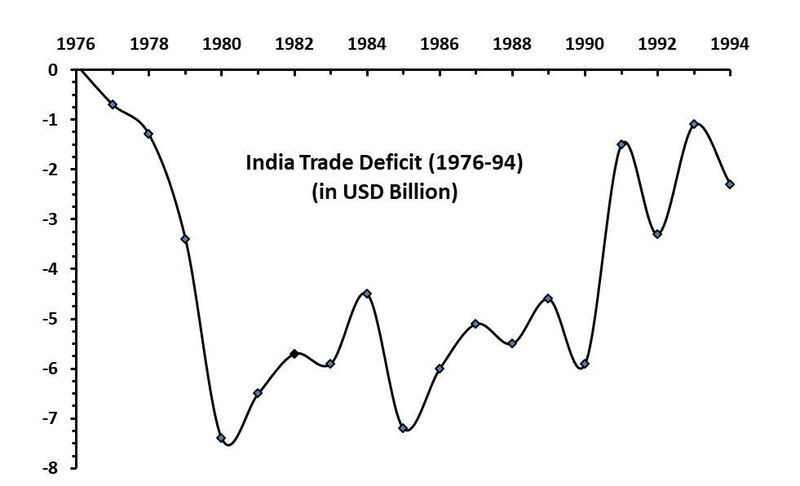 Hence during the 1980s, India had Current Account Deficit (CAD) problem which depleted India’s FOREX (FOReign EXchange) although the crude oil price went down from record high during the late 1980s. The import of consumer electronics during the Rajiv Gandhi administration increased under his so-called computerization scheme and the export did not increase at the same rate as the increase in the import bill which further exacerbated the FOREX issue. With India’s foreign exchange reserves at $1.2 billion in January 1991 and depleted by half by June, barely enough to last for roughly 3 weeks of essential imports, India was only weeks away from defaulting on its external balance of payment obligations. Therefore India had to airlift its 67 tons of gold to London to get a $600 million loan from IMF in 1991 and IMF forced India to open its economy. Again, due to record crude oil price in the global market resulting in higher trade deficits during 2011-13 (Chart 3), the exchange rate of the rupee (vis-à-vis the US dollar) tumbled from 44.17 in April 2011 to 62.92 in September 2013. 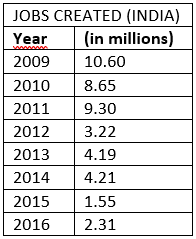 The resulting double-digit inflation as shown in Chart 4, it damaged the Indian economy significantly as it drastically reduced the job growth (Table 1) due to the adverse effects on nearly all the industries in India because of increased transportation costs. During 2009-11, the jobs created was more than 8.65 million a year which drastically reduced to 3.22 million in 2012, 4.19 million in 2013 and 4.21 million in 2014. The adverse effects of the economic downturn, in terms of job growth, are still being felt in the Indian economy. After the sharp devaluation of the Indian rupee due to the high crude oil price during 2011-13, some economists even started to write the obituary of the Indian economy. At the time, one research analyst at Morgan Stanley even came up with a new group, called “Fragile Five,” for Turkey, Brazil, India, South Africa and Indonesia as these five countries were facing a serious economic setback. One point worth noting is that Russia and China were not included in the new club of “Fragile Five”. 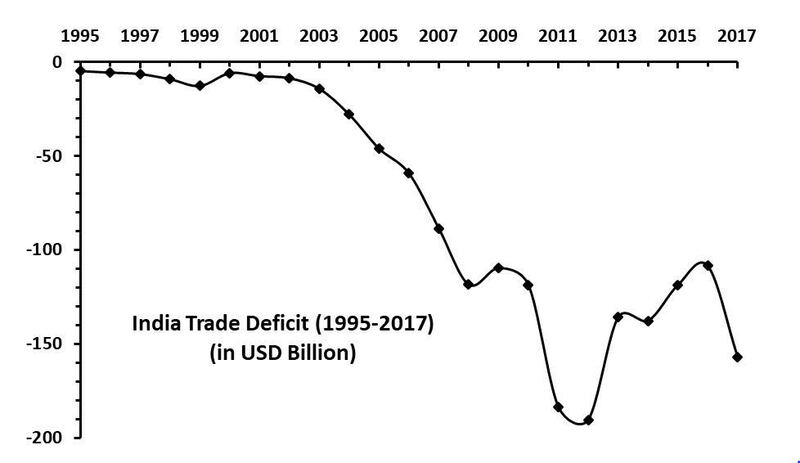 Both Russia and China have been running trade surpluses since the early 2000s. Had high crude oil price persisted for a couple of more years, it was certain that India would have had to go to the emergency ward of the IMF, wiping out its decades of development due to the IMF’s bitter medicine of getting rid of subsidies to balance the budget, significant increase in the interest rate, and selling the crown public sectors to Wall Street bankers at throwaway prices. It is worth noting that during the economic recession in the US, the US Fed reduces the interest rate so that American consumers can take a loan and spend to spur the economy. After the 2008 Great Recession, the US Fed kept the interest rate nearly zero for several years. On the other hand, the IMF, mainly run by the Wall Street vultures, forces the country in distress to increase the interest rate to 40% to 50%. The Wall Street “vultures” try to squeeze as many billions of US dollars as possible from the country in distress. Right now Argentina has to increase its interest rate to 60% (yes 60%) under IMF dictate. In the aftermath of the 1997 East Asian economic crisis, IMF actually stood for “I’M Finished” for people in the countries which went to the IMF to get a loan. Neo-cons like John Bolton, the US National Security Advisor, are guiding the present US Middle East policy and one of their main agenda is to get rid of left-over anti-Israeli regimes in the Middle East. During the Bush administration, they overthrew Saddam in Iraq, destabilizing the entire region. They are behind the US withdrawal from the Iran Nuclear Deal. They are aiming on overthrowing the Islamic regime in Iran, one of last major anti-Israeli regime left in the region. This would further destabilize the regime, causing the crude oil price to go through the roof. Any destabilization in the Middle East not only results in an increase in crude oil price, it will adversely affect NRI remittance because half of it comes from the Middle East. Following the H-1B visa restriction in the US, the UK and Australia have also started the process to restrict Indian IT professionals. It is going to significantly reduce the current $100 billion IT export sector too, making a hole in the CAD. Hence as discussed above, India needs a long-term strategy to insulate the economy from the crude oil price shock. It has to create a task force which would find the replacement of crude oil by using renewable energy resources within a time frame, say within 5 years. Otherwise, there is a bleak future for the Indian economy. Then the superpower Soviet Union, despite being a military super-power, with significant number of aircraft carriers, submarines, military aircrafts and tanks, second only to the US, suddenly collapsed in 1991 due to a severe CAD problem (please read my article Communism Collapsed Due to Collapse in Oil Price in Late 1980’s and German Banks – Not Due to Reagan). It is worth noting that even CIA had no inkling that the Soviet Union would collapse in 1991. It should be a warning to India. India should learn a lesson by having two CAD crises in two decades, both due to high crude oil price. Whose $1 Trillion is China Spending on OBOR? How much are you paying to commodity speculators? Who Do Politicians in the USA Work for?